Having never really been a big fan of cookie dough-like things, this recipe kind of happened by accident…. But knowing how fond a lot of people are of this sort of treat, it turned out to be a very happy accident! This recipe has proven to be very popular with everyone who has tried them, and the best thing is that they’re naturally delicious and good for you! 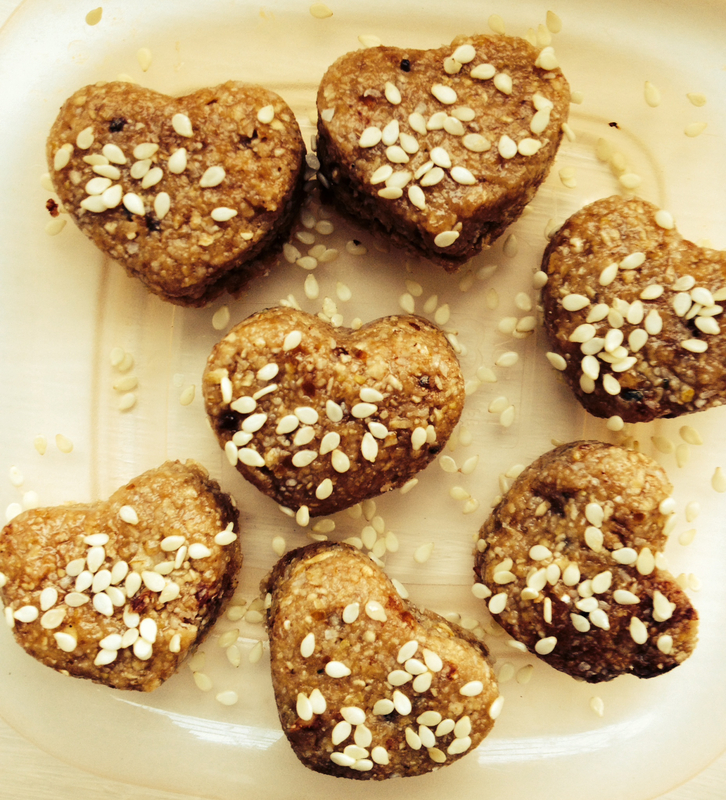 Full of energy boosting, mood-lifting, natural ingredients – these bites are so easy to make that you’ll be sharing them out in no time. Honey (add a teaspoon at a time and keep checking to see whether you need more to help the mixture bind) *Raw honey is best, and honey contains antioxidant and antibacterial properties, as well as a good amount of vitamin C. Taking local honey can help to reduce your susceptibility to hayfever too. 4-5 Dates, chopped up. *Nature’s ‘candy’, dates are great for keeping our energy levels up, and are a good source of fibre, which is important for keeping digestion healthy. 1 tsp Vanilla extract. *Vanilla extract can help to calm symptoms of anxiety, and helps to cure feelings of nausea. 1 BIG tsp Peanut Butter *Peanuts contain electrolytes, which are vital for replenishing all the nutrients we lose through exercise, peanut butter is also a great source of vegan protein. 1 tsp Cinnamon. *Another brilliant blood sugar balancer, cinnamon also reduced levels of LDL or ‘bad’ cholesterol. 1 tbsp Lucuma powder (optional)*This will make for a sweeter taste, but isn’t essential – Lucuma contains good amounts of minerals such as iron, phosphorus, magnesium and potassium, which are all important for maintaining energy levels and a strong immune system. 1 tbsp Macca (optional) *This superfood is another source of energy, and is helpful in balancing hormone levels. It can also be used to help clear up skin issues like acne and psoriasis. Sesame seeds for sprinkling *Sesame seeds contain two unique substances known as sesamin and sesamolin, which both help to reduce cholesterol, lower high blood pressure, and can help to keep the liver healthy. Add the peanut butter, honey, vanilla extract, cinnamon and lucuma powder or macca if you’re using it, and blend until everything is combined. You may need to keep adding a little bit of honey at a time so everything is nice and stuck-together, or add a little water to the mixture. Take your sticky mixture out of the blender and place on a chopping board. Handle the mixture until it’s pretty firmly compact, and then flatten on to the board so you end up with a big, thick, pancake-like thing. Either use a cutter to cut yours in to shape, or separate the mixture in to bite-size pieces and roll in to balls. Sprinkle your sesame seeds over the top of your little bites, pressing them down gently so they stick – or if you’ve made yours in to balls, roll them around in some scattered seeds to lightly coat.